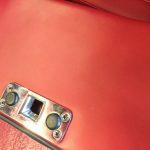 Leather Care Berkshire » Some examples of our work. Click on the image to view before and after pictures. 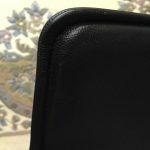 Aniline leather is very susceptible to staining. So when a piece of chocolate was dropped on to this cushion and the body heat then melted the chocolate, the leather then absorbed the chocolate leaving this dark stain. 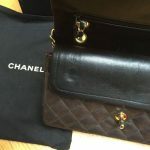 The damage to this Chanel handbag was caused by the zip of the bag, as the zip abrades the leather when the bag is closed. 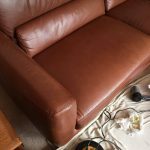 Unfortunately I was only able to tidy the damaged area but my client was very happy with the improvement. It was a pleasure to work on this Mercedes-Benz 300 SL. The damage was very slight (highlighted in the 4th photo) but my client wanted the car in perfect condition. I do love my job.